CinqueTerre – top of the list for many…Piedmont, Lake Como, Lago Maggiore, and more…. CinqueTerre the lovley coastal area north of Tuscany, the Piedmont known for its wonderful wines, medieaval villages and great food, Lake Como and more …read on. On These pages we have included some of our favorite properties in the Cinque Terre ( Liguria) as well as villas and charming hotels in the Piedmont region and the Italian Lake District. CinqueTerre, a favorite of Rick Steves, these small colourful out of the way villages have attracted attention for many years, but it was Rick Steves who “discovered’ these charming villages and brought them to the travellers’ consciousness. Now a stopping off point for many, these remote and not so easy to reach villages are something on everyone’s bucket list. Vernazza, Monte Rosso, RioMaggiore, are names that pop up on many lists; if you have been to Italy before, then I recommend a visit, whether just an overnight, or a little longer to hike and enjoy the fantastic views and hiking possibilities. If you are coming to Italy for the first time and you have only a short time, perhaps leave it for another visit – as it takes some time to reach here, and to visit each village is a beautiful but time consuming exercise. Discuss with our experts to see if you can do this charming area justice on a short first time trip to Italy… we can help you work it in…or make alternate suggestions. 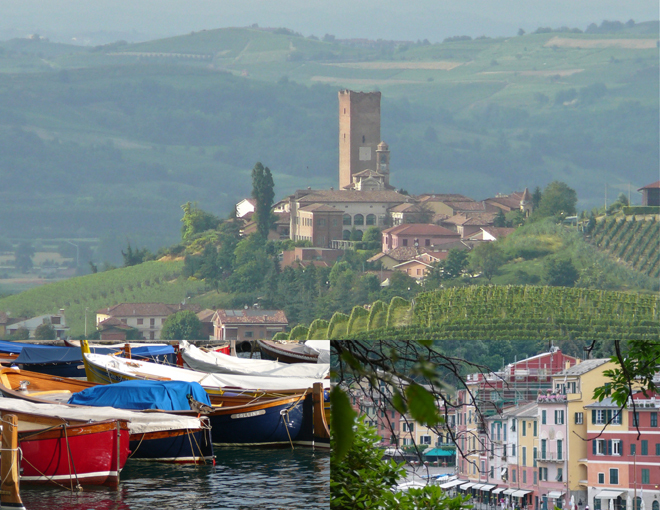 Piedmont – Barolo, Barbaresco…known for its amazing wines this regions offers lovely medieval villages, castles, great wines tasting, and fabulous food, the home of the Italian Slow food movement. Here we offer some very nice itineraries with our Italian host…you can spend a day with her visiting medieval villages, some unique wine tastings, and more (refer to our trip design pages) ; we have some very nice Relais and charming boutique hotels and inns in this area. Nestled in the majestic Alps of Northern Italy, the breathtakingly lovely settings of Lake Como, Lake Maggiore, Lake D’Orta and Lake Garda have inspired countless poets and artists, breathtaking views, the Alps as a background and the lakes shimmering below, flower-bedecked promenades, lemon trees, villas, parks and gardens, and crystal-blue waters, it is an old-fashioned resort area. Grand old villas and hotels …. LAKE MAGGIORE – Stresa - The most elegant town on the shores of Maggiore; Cannero -A quiet town with a lovely lakeside promenade; old cobbled streets and ancient romantic ruins of castles rising from the lake. LAKE COMO - Bellagio - Positioned on a promontory where the Lake forks, the "Pearl of the Lake". Tremezzo - Opposite Bellagio, another beautiful hillside village, surrounded by a profusion of orange and lemon groves, magnolias and laurels. Varenna - Situated on the north eastern shore of Lake Como, Varenna is a small, relaxed spot shaded by pines and with a distinct feeling of bygone times. LAKE GARDA - Riva - At the northwestern tip of the lake this fashionable resort has been a popular destination since the late 19th century. Torbole - With a wonderful location and pretty harbour Torbole is a popular destination for water sports enthusiasts. The waterfront is lined with cafes and bars, which come alive in balmy summer evenings. At the moment – we offer these charming villas and lovely hotels in the area – we are continually adding new properties – so please contact us and let us know what you are looking for.